The ruins of Roslin Castle lie hidden down a steep narrow path accessible only on foot, below Roslin Chapel in Roslin, Midlothian. 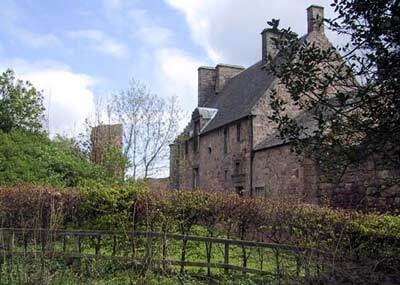 Little is left of this 15th century building in which Mary stayed on 31st August 1563 during her tour of the south west of Scotland. 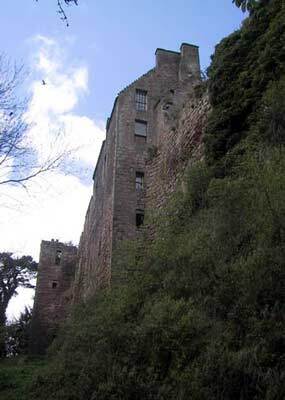 Encircled by the North Esk River, Roslin castle was built by the Sinclairs, Earls of Orkney. 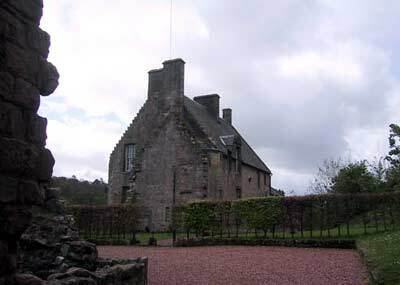 It was badly damaged during the English "Rough Wooing" attack of 1544, during which Henry VIII tried to secure the marriage of his son Edward to infant Mary, Queen of Scots. The only habitable building nowadays, which is owned by a holiday let company, is within a 1597 hall and kitchen block on the south east side of the castle. Walking down the gorge below and around the castle, one can see that this block is actually raised on the foundations of an earlier wall. The access stone bridge was originally a drawbridge tower linked by a collapsible wooden bridge, over a much deeper gorge than it is today, having been partly filled up with rubble. Opposite the old kitchen block are the remains of the gate-way blockhouse. But there is more to Roslin Castle than meets the eye. 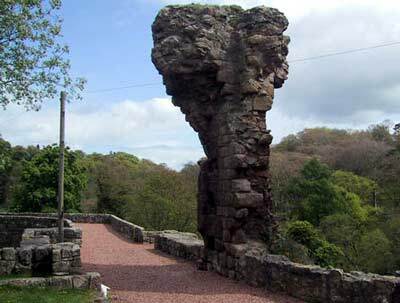 Legend has it that it is haunted by a black knight on horseback and a phantom hound, whose eerie baying is heard in the woods around the castle on dark and stormy nights...On February 24, 1302, the castle was the scene of a major battle between Scots and English forces. One large war hound, owned by an English knight, viciously attacked the Scotsman who had killed his master and was slain in his turn. Later that night, the spirit of the hound caused panic in the guardroom returning nightly. Eventually, the Scotsman who had been responsible for the death of the "Mauthe Doog" (as the hound was nicknamed by Roslin Castle's soldiers) and his master, was heard screaming down a passage of the castle over the snarl of a hound. Panick-stricken, he fled upstairs and died three days later. 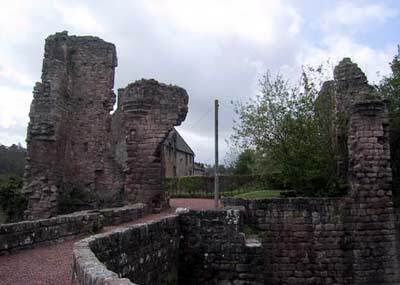 Roslin Castle is not open to the public, but can be viewed from the outside.